Do you know what your credit score is? I’ll be honest, my credit score at one point was respectable. Then, I got in a bit of trouble with my credit cards and my credit score suffered because of it. Now I’m at the point where I’m trying to become debt free on my own and repair my credit score in the process. Not always easy but I know the journey will be well worth the effort. Learning to live within a budget has not been an easy journey. It’s always been easier for me to spend money instead of just save it. But, reality is that if I want to work on repairing my credit and get out of debt, I know that I need to save money and be more mindful about how I spend it. I’ve definitely gotten better, but I know that there’s also room for improvement. 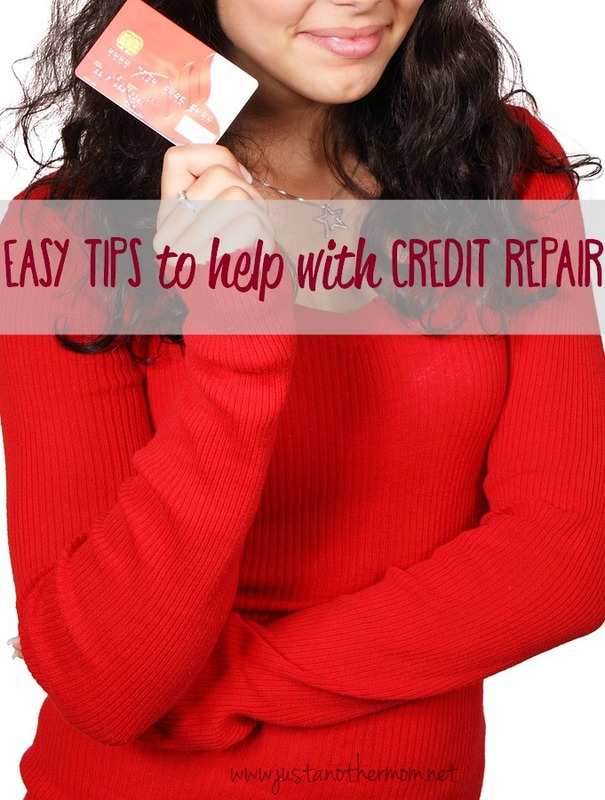 That’s why I wanted to share some easy tips to help with credit repair. The key to effective credit repair is gaining a thorough understanding of what is truly possible and how to achieve the results you want. Use the tips that follow, and you will be on your way to a more secure financial future. Pay off your bills before they are due. When you make credit card and bill payments ahead of schedule, it allows you to reduce the amount of interest you accrue while simultaneously strengthening your overall credit score. Even paying your bills a mere week early can make a drastic difference. Do not do a lot of things that require your credit report to be pulled because it will have very negative results. When your credit report is pulled that is a “signal” that you are applying for more credit and it causes a reduction in your credit score. Also keep track of your credit. Watch your credit report, especially if you have a history of credit problems. You may see unexplained negative reports pop up or new accounts opened that you cannot account for. There’s nothing worse than facing identity theft while you’re already trying to repair a damaged credit score, so try to catch it early. When taking steps to repair your credit, avoid closing or even lowering limits on your credit cards. A big part of your overall credit score relates to the ratio of your used and available credit. The lower the percentage of used credit vs. available credit can give your overall score a big boost. Make sure your check is going to clear before you put that stamp on the envelope. Bad checks may not show up on your credit report from the Big 3, but it does affect your credit elsewhere. A bounced check is reported to ChexSystems which is used by the banking system. A history of bounced checks can spell disaster when you are out shopping for a loan. Always pay your bills on time. The way you pay your bills accounts for almost one-third of your credit score. If you make a payment late it stays on your credit report and will affect your score for a whole 7 years. If you haven’t been paying your bills on time, start now. Rebuilding credit is never easy. It is much easier to spend money freely. However, once you have satisfied your credit card and other high interest household debt, you need to next focus on contributing to your employer 401k plan. In most cases, the employer will match your contributions enabling you to build a nest egg very quickly. Even if your situation is desperate, you should avoid the “Payday Loan” companies. You may get money advanced to you quickly this way, but you will pay dearly for it. Their interest rates are very high, which means you are just increasing, not solving, your current debt problems. Avoid using credit cards. This is helpful when you are in debt and can’t pay back what you already owe. It is also good to avoid charging things to a credit card that you can’t immediately pay off. This will help you from acquiring any other debts that you can’t pay. People who are trying to repair their credit by looking for credit repair services should be wary of credit repair scams. There are a number of companies who claim to offer free advice from credit experts while they are overcharging you greatly for information you can get freely on your own. Credit repair does not happen overnight but is something that must be learned over a period of time. It takes you time to get bad credit and it’s going to take some time to get back to good credit. However, the good news is, that there is information out there. The sooner you get started, the sooner you can repair your credit.